Over the past several days / week, I've been trying to work on applique completed using the embroidery machine. My first attempt was to have the outline sewn down by the embroidery machine and then trim the fabric myself in the hoop and then continue on with the applique. I'm going to need a lot of practice with trimming this way. After some research, I see that some people print out the outlines first and then cut their fabric prior to going to the embroidery machine. So, I gave it a try. Mind you, the scrap fabrics and colors are clashing since I'm using leftovers for practice. I also picked a very basic shape but one with several corners. 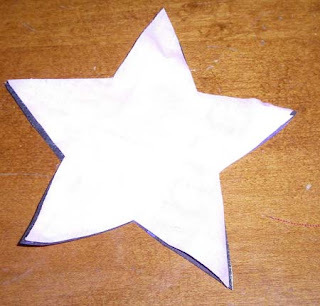 First I printed out the shape using the embroidery program and then I cut out the star shape with pink fabric. I used a piece of double sided tape to keep the fabric from moving while I was cutting it out. I guess you could use pins, adhesive spray, etc. 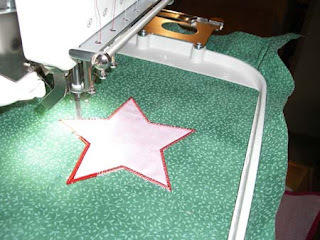 First, the design outline was stitched by the embroidery machine. 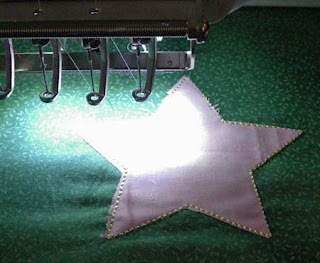 I then placed adhesive spray on the star and placed it very carefully over the outline and started the machine on it's stitch down layer. Finished the zig zag sew down layer and then on to satin stitching it down. The satin stitch seemed to pull in and cover any smaller miscuts. 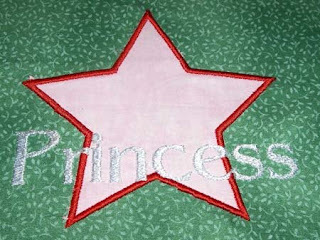 I placed some text over the star to see how that is handled over applique. Probably should have positioned it a little bit better or decreased the size to not have overlap. Not too bad, but need lots of practice.